Wilhelm was a successful writer in 19th-century Germany. 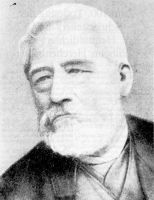 Born 1818 in Neunkirchen, Wilhelm first became a bailiff's assistant in the nearby town of Hennef, later a teacher near and in the city of Düsseldorf, where in 1850 he founded his own (boys') school. From 1866 onwards, he focused on writing, and by the time of his death in 1889, his works comprised over 300 books. Most were renarrations of local folk tales or told stories of his own imagination and were usually targeted at young readers, centering around issues of (Christian) morality. However, Wilhelm also wrote novels with an historical background, travelogues and books of educational intent – e.g. about natural history or a nowadays especially anachronistic guide to the upbringing of daughters. His works once had a quite high circulation and were even translated into several other languages, but can meanwhile only be acquired from antiquarians or on eBay, as publication ceased in the 1930s. To save you the trouble, some can be found on the right as PDF files.